It happens to everyone: You follow a recipe to the letter, and yet the dish still doesn’t turn out Instagram worthy. Well, the first step to recovery is acceptance; you have to come to terms with the fact that your kitchen is a den of lies. It's a place where measuring cups aren’t always what they say they are, the scale is suspect (unless you use one of the best), and your oven is so imprecise it should come with a fast-talking lawyer absolving the appliance of any responsibility for the nasty case of salmonella caused by an undercooked chicken. Temperature control during cooking can be a challenge, whether you’re roasting a chicken, making caramel apples, or frying just about anything. But you can remove a lot of the guesswork with a precise thermometer. We’ve written endlessly on Serious Eats about the value of a good instant-read thermometer—one that you stick into a roast or dip into a pot of oil to get a quick reading on the temperature—but we’ve spent a lot less time on the value of a leave-in probe thermometer. And, to be honest, they’re really useful. Unlike an instant-read thermometer, the leave-in style has a pointy probe that remains in the food while it’s cooking. The probe is tethered to a heat-resistant cable that runs to a base unit with a temperature display and other functions. Whether you’re cooking in the oven, on the stovetop, out on the grill, or in a smoker, a leave-in thermometer gives you a live feed of exactly how hot your food is at any given moment. And being able to monitor the temperature of what you're cooking can sometimes mean the difference between a perfectly cooked prime rib and one that’s gone gray and dry in the center or candy that’s still in the softball stage and not sliding into hard-crack. We rounded up 15 models, ranging from around $20 to $190, and put them through accuracy, precision, and ease-of-use tests to find the ones that work best. The ChefAlarm is one of the most precise units we tested and it's also easy to use. The probe, which comes with a pot clip, has about six inches of usable length to reach into the thickest roasts, and springs on both ends of the 47-inch-long cable protect it from wear at common failure points. The base, which can be calibrated by the user, has a large, intuitive display that pivots for easy reading, as well as clearly marked buttons for setting temperature alerts, the timer, and alarm volume. Precise enough for most cooking tasks, the Polder is intuitive to use and has a kink-resistant, round cable that was the most effortless to work with. The base’s display tilts, making it easy to read on the countertop or when stuck to the oven or refrigerator with magnets. Its six-inch-long probe is tied for the longest we tested, and it comes with one of the best pot clips we used. The precise two-probe Smoke is designed for grillers and barbecuers, but it’s just as handy indoors. Use the cooking probe to gauge the temperature inside a roast, and the ambient probe to track the oven, smoker, or grill’s temperature. The Smoke also comes with a wireless radio receiver you can carry up to 300 feet away, allowing you to keep an eye on temperatures even when you’re not tending the fire. It, too, can be calibrated at home. If you’re seriously into barbecuing pork butts, briskets, and ribs, the FireBoard is the brainiest thermometer we tested, aimed at making your cooks more predictable. With ports for up to six probes, each with nearly 72-inch-long cables, the precise FireBoard keeps an eye on the meat and ambient temperatures, then displays them on the base’s readout—and your smartphone over Bluetooth or a wireless network. The app allows you to name, chart, and store your smoking sessions. The base also has a port to accept a fan accessory that controls the temperature of most smokers or charcoal grills by adjusting airflow. The FireBoard can be calibrated, but that requires sending the unit back to the manufacturer and paying $50. First things first: Checking to see how accurate the thermometers are in a pot of boiling water. Even a cook with the best intentions can be foiled by a moment of distraction. More than once we’ve babysat a roast, dutifully checking the internal temperature with an instant-read thermometer every 20 or 30 minutes as it edged ever closer to its target temp, and then something stole our attention away for ten brief minutes and the next time we checked the meat was five degrees above the temperature we wanted. Just as annoying is trying to get an accurate read on a saucepan of caramel or a pot of frying oil with an instant-read thermometer in one hand and a whisk or gloppy pieces of dredged chicken in the other. Not only is it difficult to keep the thermometer steady, which makes for dubious temperature readouts, but you really need both those hands for cooking. That’s where a leave-in thermometer comes in. Just stick the probe into the roast, snake its cable out the oven door, and you’ll know exactly when the meat hits a perfect medium rare, especially if the unit has an alarm that sounds when the target is reached. Or, in the case of candy-making and frying, just clip the probe to the side of the pot. With your hands free and the probe stable, you can comfortably cook while getting consistent and accurate temperature data at the same time. But that assumes the thermometer is well made. To make our list, a thermometer first and foremost needs to be accurate and precise. Think of them like a game of darts: If you’re accurate, the darts land in, or near, the bull’s-eye every time. If you’re precise, the darts consistently cluster in the same tight spot, but that spot could be anywhere on the dartboard. We want both: A thermometer that reads 212°F (100°C), or very close to it, in a pot of boiling water and around 32°F (0°C) in an ice bath—over and over and over again. Some might wonder why we put such an emphasis on accuracy and precision, given that we’re talking about making dinner and not, say, building the thermal shields on a space shuttle. While laboratory-level precision and accuracy isn’t necessary for most meals, it's still helpful to have a reliable tool. If a roast shoots past the target temp by 5°F, dinner won't actually be ruined, but with an inaccurate thermometer, you risk compounding the problem. Combine a little human error with a thermometer that's a few degrees off, and suddenly what looks like five degrees of overcooking could actually be closer to ten degrees, and that can mean the difference between a rare prime rib and one that's medium, which not a few people would consider a tragedy at best and sacrilege at worst. When shopping for probe thermometers, you’ll notice they come with anywhere from one to six probes. Unless you plan on taking the temperature of two or more meats at the same time, a single probe thermometer should cover most routine cooking tasks. Having a base that accepts multiple probes becomes especially helpful when cooking outside. You can dedicate one probe to measuring the ambient temperature of a grill or smoker, where the dial thermometer can be notoriously misleading, while others monitor the food. While these aren’t instant-read thermometers, where speed is paramount, faster is still usually better when it comes to a probe thermometer. Some of the faster models respond to temperature changes in one to three seconds, which is plenty fast. Beyond speed, we’re looking for usability: Better leave-in thermometers should be able to hold onto the side of a pot while frying (with a pot clip), hover just above the grates in an oven or grill (with an ambient probe clip) to measure ambient temperatures, and have cables and probes durable enough to use while cooking with high heat. We tested a handful of third-party pot clip accessories, but many of our thermometers didn't fit them. Some of the models we tested come with either a pot clip or an ambient probe clip (none came with both), but aftermarket versions of both clips are available. We tested five of those third-party pot clip accessories and found one we like—from Vorey—but only the ChefAlarm, Smoke, Dot, and Carbon Lite models fit it. Our winning ChefAlarm and Polder models come with their own pot clips, which makes them especially good choices if you do a lot of frying or baking. Ambient probe clips are designed to squeeze between the narrow gaps on a grill or smoker grate. They don’t hold well inside an oven, unfortunately, where the grate spaces can be up to four times as wide. They can work in the oven, but you have to modify the grate clips: thread the probe through the clip, then pull the ends of the metal clip apart slightly. Test the fit on the grate; it should hold steady without tipping over, but if it doesn't, just stretch it wider if it doesn’t grip. (ThermoWorks has a video on their site that offers you a visual guide.) If you don't feel like messing with the grate clips, there's also a low-tech solution: Try cutting a potato in half, sticking the probe through it, then resting the flat, cut side of the potato on the oven grate (you can cover the flat side with tin foil to avoid making a mess). After evaluating how well each model measures temperatures, we also considered how easy they are to use. The base unit should be intuitive to navigate, and setting target temperatures shouldn’t require a deep dive into the manual. We got the hang of most of them after the first or second use. We preferred the tactile feedback of physical buttons, either rubber or plastic, over sleek touchscreens. Only two of the models we tested come with a case, which is helpful to corral the long cables and pointy probes. Most thermometers use replaceable AAA or AA batteries, though a few have internal batteries that aren’t as easy to change at home. For thermometers that pair with a smartphone, we tested syncing, updating, and adjusting their temperatures and notifications, all of which should be painless. The results were hit or miss: Some thermometers required multiple attempts to pair, others were seamless. To select specific models to test, we cross-referenced reviews on Amazon, Cook’s Illustrated (subscription required), The Wirecutter, and Fine Cooking. We tested accuracy and precision using water held at a few different temperatures. You wouldn’t wear a watch that keeps time poorly, would you? So, when it comes to a thermometer, you want a tool that’s accurate, one with a readout that reflects the actual temperature of whatever it is you’re measuring—the inside of a roast, a pot of shimmering oil, or the ambient temperature inside an oven. On top of that, it should be precise in its measurements, meaning it should read a given temperature consistently each time. To test accuracy we placed the probes in a quart-size ice bath, a quart of room-temperature water, a pot of water held at 130°F (54°C) by an immersion circulator, and a pot of boiling water. For each test, we used a lab-calibrated ThermoWorks ThermaQ Blue thermocouple tracker as the control, and we charted the temperatures each thermometer registered. Most of the thermometers read the control’s temperature within three degrees during each test. While it’s not terribly inaccurate, the Weber’s display bounced a degree up and down, which is kind of annoying. The Maverick and one of the ThermoPro models couldn’t read down to freezing, earning disqualifications. Then, we measured precision two ways: First, by pulling the probes out of the room-temperature water, bringing them to slightly warmer than room temperature (by squeezing the probe tips between our fingers until the display changed), and then dunking them back into the water, and noting the readout 10 times over three minutes. Secondly, we charted temperatures every 10 minutes over an hour during the immersion circulator tests, to see if the numbers fluctuated. The numbers from reading to reading on both tests changed only slightly as we saw similar total fluctuation of around ±2°F. The Weber’s bouncy readings persisted through both tests. We made an ice bath and used it to check if each probe was reading 32°F correctly. We filled a container with crushed ice and cold water, then let it all settle for a couple of minutes. We used the ThermoWorks ThermaQ Blue as a control, careful to not let the sensor rest against a chunk of ice, which could give false readings. Then we dunked each of the thermometer probes in, swirling them around to avoid ice, and charted three consecutive readings, warming the probe tips to about room temperature between each test. The ChefAlarm, Smoke, and FireBoard, which all have a resolution of 0.1°F were accurate within 1 to 2°F of the control’s 32°F (0°C) temperature and were precise, with readings varying no more than .6°F. (All three of these models can measure below 0°F (-17°C), which is useful if you want to check your freezer.) The Polder doesn’t go lower than 32°F (0°C), and our tests bore that out, with the display shifting to "LO" once it dropped below 34°F (1°C). We disqualified two models that would not read temperatures below 50°F (10°C), which makes working with refrigerator temps difficult. We filled a container with tap water and let it come to room temperature. With a thermocouple acting as a control, we tested each probe 10 consecutive times over three minutes, warming the tip of the probe with our fingers between each measurement and charting the readings. The results from our winning, higher-priced thermometers were comparable with the ice water test: The ChefAlarm, Smoke, and FireBoard were very precise and accurate. Over 10 attempts the most these three models varied was .6°F, and the readings were always within 1°F of the control. The Polder, which measures in whole numbers, varied by 1°F in two of the 10 readings, and always kept the display within 2 or 3°F of the ThermoWorks control (Polder told us the accuracy on the model we tested was ±2°F, or about 1°C). While most of the thermometers were both precise and accurate at room temperature, we noticed the Weber thermometer had trouble settling on a temperature as the display bounced up and down by a degree or more. We used an immersion circulator to keep a pot of water at a constant temperature for an hour, while taking readings to see if any changed over time. To see how well the thermometers could read a fixed temperature over time, we set them up with the Joule immersion circulator (read Kenji’s review of it). We filled a pot with water, set the Joule in, and held the probes and a thermocouple control in it for one hour, recording the readings every 10 minutes. Our target temperature: 130°F (54°C), which is about medium-rare for steaks. With the control and the Joule reading 130°F (54°C), the ChefAlarm held that temp at each reading, fluctuating by only .1°F. The Smoke’s cooking probe was just as accurate, though the ambient probe (which can be used with liquids, just don’t fully submerge it) usually hung around 129°F (53°C). The FireBoard’s meat and ambient probes, along with the Polder cooking probe, read around 129°F (53°C) for most of the hour. None of the other thermometers in this test were more than 3°F from the target, though the Weber often vacillated between two temperatures. We repeated a similar test using boiling water and found little change in performance. Typically, the thermometers that ran a degree or two cooler or hotter continued that trajectory once the water reached a boil. The Probe or Base: Which is Responsible for Accuracy? Nearly all of the thermometers we tested have probes with 2.5mm inputs, which are slightly larger than the jacks on headphones. Since the probes are technically interchangeable, and many can be purchased separately, we were curious about whether the brains in the base unit or the quality of the probes was more responsible for a thermometer being accurate and precise. We mixed and matched, pairing probes that were less accurate with their original base unit with some of the most accurate base units, and vice versa. Did the mashup work? The short answer is no, not across brands. We discovered that quality didn't lie in just the base unit or the probes, but the specific combination of each brand’s two parts. Only when correctly paired, did the probes and base units take the most accurate readings. In just one example, we plugged the probe from the precise ChefAlarm into the bases of three thermometers that were consistently off by a degree or two, and took the temperature of water warmed by an immersion circulator. The ChefAlarm’s probe made the units even more inaccurate—in one case the readout was 32°F off the mark. When buying replacement probes, stick with the brand that manufactures the base unit. To see how quickly the thermometers reach their final temperature, we dunked room temperature probes into ice water and recorded how long it took for the base’s display, or our smartphone, to adjust. While some of the leave-in models we tested read down to freezing quickly, none are faster than an instant-read thermometer, which gave us the temperature in the same test in about two seconds (we tested one for comparison). The ChefAlarm was the fastest, reaching the actual temperature in about five seconds. The Smoke and Polder were just a second or two behind. The FireBoard, which was quick to register an initial temperature change in about four seconds, needed 40 seconds to finally get down to the actual temperature—that’s fine for low-and-slow barbecuing where temperatures change very gradually, but could be a problem in a pot of caramel, where things are happening a lot more quickly (to be clear, the FireBoard was not designed for things like caramel making, which is why it’s our pick exclusively for grilling and smoking). The rest of the field ranged from 11 seconds to well over a minute. Nearly all of the models were fast to register an initial change in temperature—most displays started moving in about three seconds—but they are not quite fast enough to stand in for a true instant-read thermometer. We tossed a pork roast in the oven to see how intuitive the thermometers are to use. Once we knew the thermometers were accurate, we wanted to see how they handled a real cooking scenario. We pierced a large pork loin with probes, then roasted it in a 450°F (232°C) oven. We set the thermometer alarms to go off when the probes measured 135°F (51°C). As expected, the alarms sounded at varying times, depending on where the probes were located in the roast. Each one came tethered to a cable that was long enough to make it out of the oven to its base, situated on a nearby countertop. All the cords were thin enough that they didn’t interfere with the oven door closing. While all of the probes were long enough to take a reading from the thick roast, we appreciated the longer probes, which give you more depth to plumb. If you have a wall oven (or refrigerator near the range), a magnetic display is helpful to keep the readout at eye level. Most of the LCD displays on these thermometers are on the dim side to preserve battery life, though some brighten for a few seconds when you start pressing buttons or hit the backlight option. We liked the ChefAlarm’s varying alarm volume, but what we appreciated more is any thermometer that will instantly silence the incessant beeping with the push of any button. We’ve all anxiously mashed buttons to quell a nagging alarm, and thankfully most of the models do that by pressing any button. Want to know what the temperature of your food is when you’re not in the kitchen? Some of the models we tested pair with smarpthones, while others come with a handheld you can take with you. During testing we measured things like cable length, probe diameter, and useable probe length. We took note of which design features we liked, and which we didn’t. As mentioned earlier, if you plan on temping frying oil or making candy, look for a thermometer that comes with a pot clip. The useable length of the probes in our test ranged from 6 to about 3 1/2 inches, and our winners all have probes that measure five inches or longer, which provides the best access into large cuts of meat and deep pots. In today’s wired world, we all know too well the importance of proper cord management. The cords on our models ranged from 36 to 72 inches long and, with a few exceptions, they were all cumbersome to manage and easy to kink. Some models, like Weber and GrillEye, come with accessories to make winding the cord up for storage easier. For most indoor cooking, where a countertop or magnetic refrigerator is often close by, shorter cord lengths are fine—we never felt any were of an insufficient length. We like the cords on both Polders, which are round and covered with silicone, as opposed to the kink-prone, flat, stainless-steel braided cables most models have. The controls on the thermometers range from the basic—the Dot has little more than up and down arrows—to more complex, like the ChefAlarm’s 13 buttons. After the first or second time, we were able to navigate the menus and set target temperatures, alarms, and timers, for those equipped with that feature. Some of the smart thermometers are easier to work with than others. Models with a companion app pair the base to your smartphone through Bluetooth or WiFi. There are some models that aren’t “smart,” but do come with a secondary handheld unit that displays temperatures beamed to it via radio waves. We found pros and cons to each style. Pairing with Bluetooth is relatively easy (the Carbon Lite was the fussiest we tested) and it utilizes your smartphone, which you’re probably going to have on you anyway. But the range is short (33 to 300 feet, line of sight), and can too easily drop at far shorter distances when walls and other obstructions are solid (we’ve lost a Bluetooth connection as soon as we left the kitchen). WiFi can be easy to setup, tends to have a more robust connection, and you can access information about the temperatures anywhere with your phone. For most home cooks, this feature is overkill, but if you’re smoking a brisket for 12 hours and want to check the temperatures while you’re across town at work, it comes in handy. Models that use a radio frequency pair with a receiver with a push of a button (the range is about the same as Bluetooth, but less affected by physical obstructions), but you do have to carry around the clunky receiver. If you plan to be around the house while using the thermometer, but not necessarily in the kitchen, we had a good experience with the ranges on the ThermoPro TP20 and Smoke, which worked via radio waves across our office through a few walls. We picked winners based on accuracy, precision, and ease of use. What we liked: The ChefAlarm finished at the top, or near it, in all of our precision and accuracy testing, and the readout responds in just over a second. This general purpose thermometer works in the oven, on the cooktop, in pots, or while grilling. The ChefAlarm is a calibratable model with a solid reputation for reliability, and it didn’t disappoint in our tests. The screen is large and while it displays a lot of information at once, it’s all well organized. The magnetic base rests flat, which is handy when stuck to the outside of an oven, or props up at around 45 degrees for easy viewing on countertops. The ChefAlarm’s buttons are large, clearly marked, and rubbery, so pressing them with wet or greasy hands isn’t an issue. The built-in timer also shows you how much time has elapsed since the alarm went off. The probe, which is one of the longest we tested, uses metal springs to help protect the cable from wear, and comes with a decent pot clip. What we didn’t like: The base does not come programmed with meat doneness temperatures (although this isn't entirely bad, since a lot of commonly held temperature recommendations aren’t what we’d suggest, such as cooking chicken to 165°F). That said, the ChefAlarm does include a card with recommended temperatures for things like beef, pork, fish, and syrup. What we liked: Accurate and precise enough for most common kitchen tasks, the Polder is just about the smallest, lightest, and easiest-to-program thermometer we tested. The adjustable display is easy to read, well organized, and the buttons, while smallish, are workable even with wet hands. The probe responds quickly to temperature changes and is as long as the ones that come with the more expensive ChefAlarm and Smoke. The round, silicone covered cable is easy to work with and resists kinking better than flat cords. The Polder also has the best pot clip that we tested. What we didn’t like: Like some other models, the power switch isn’t with the rest of the controls, but on the bottom of the base. The thermometer doesn't have programmed meat doneness temperatures built-in (though, again, we’re not so bummed about that). The cable is only rated to 450°F (232°C), which means it might not be ideal for high heat grilling. What we liked: Like the ChefAlarm, the calibratable Smoke is precise and always stayed within an incredibly tight accuracy range. The base is clean and easy to navigate, and while each probe has five numbers associated with it (minimum and maximum temperatures that update while you’re cooking, the current temperature, and adjustable alarms for minimum and maximum temperatures), it’s not as confusing as it sounds. The cooking probe is the same style and quality as the one used in the ChefAlarm, and it comes with an ambient probe and clip (the clip works well on grill and smoker grates, nd can be modified to work in an oven). The included handheld radio receiver arrives already paired, for those times when you want to walk away from the oven. If you want to check two portions of meat at once, a pair of roasts at the same time, or two parts of the same roast, you can pick up a second cooking probe for around $18. What we didn’t like: A similar issue with all of the ThermoWorks thermometers we tested (and also the Polder): The power button is on the back, which we’re still not used to. Strong magnets give a thermometer base a good hold, but the Smoke’s are bordering on overkill (it’s a superglue-like hold). No presets for meat doneness, though a chart with suggested temperatures comes with the kit. What we liked: Accurate, precise, and scalable up to six probes, the FireBoard is a smart thermometer that’s best suited for serious barbecuers or cooks who want to track multiple roasts at once. The thermometer body is lightweight and has an integrated battery rated for around 500 charge cycles. The five-inch-long probes come on six-foot-long cables, giving them the longest reach of any model we tested. But what sets the FireBoard apart is the system’s app and data-logging feature, which lets you name each of the probes and keeps track of the time and temperature of your cooks, so you can learn what works and what doesn’t. While we didn’t test it, there is a port on the base that connects to a small fan. Attach that fan to a compatible charcoal grill or wood smoker and you can control the temperature of the fire, remotely, by adjusting the flow of oxygen. The FireBoard also connects to your home’s WiFi network, enabling you to check on temperatures from the grocery store, work, or anywhere you can get online. What we didn’t like: Bluetooth and WiFi pairing can be fussy at times. While there is a readout on the base, it’s small, which means you should plan on keeping your smartphone around if you want to spot-check temperatures. The ambient probe clip work very well on oven grates, after some slight modifications. The magnetic Dot has a very intuitive design and a great probe that’s about 1 1/2-inches shorter than the ChefAlarm and Smoke. It was accurate, only off by a degree in the immersion circulator and water boiling tests, but for about half as much, the winning Polder is nearly as accurate and includes a pot clip. We tested three models from ThermoPro. Designed for outdoor grilling and smoking, the two-piece ThermoPro TP20 has a large handheld display you can use to read and change temperatures up to 300 feet away, without using a smartphone. It comes with two cooking probes that had trouble reading 32°F (0°C), and while it only missed by a degree here or there over testing, it was also slow to adjust from hot to cold, needing 3 1/2 seconds to register a temperature change. The ThermoPro TP12 is like the TP20, but comes with one pointed probe and one ambient probe. Despite claims it can read down to 32°F (0°C), any time we chilled it below 50°F (10°C) the readout displayed dashes instead of numbers. We like the separate timer function built into the ThermoPro TP16, and while it was reasonably accurate, the build doesn’t feel robust. Like the ThermoPro TP20, the Maverick, had trouble reading down to freezing, showing a series of dashes instead of numbers. This model was also slow to read changes from room temp to icy water, needing more than six seconds to register. 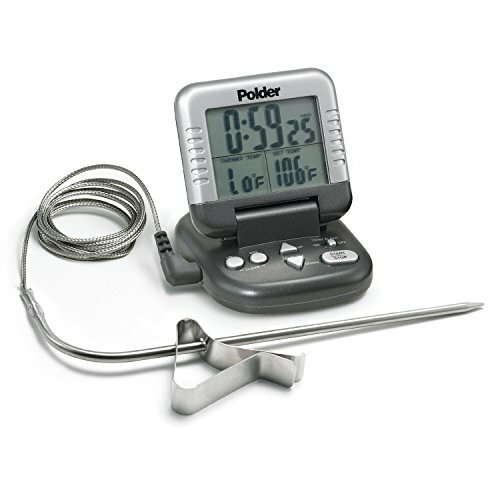 The accurate Polder Digital BBQ / Smoker Thermometer’s downfall is a touchscreen that is tricky to use with wet or greasy hands and temperature presets that are finicky to override. But, we liked the big, bright display, and kink resistant, round cable. Weber’s app for their iGrill 2 device is easy to use and pairs quickly with the thermometer. But we found this model slow to register temperature changes, and it took nearly 30 seconds to go from room temperature down to freezing. What bothered us more than the 1 or 2 degrees of imprecision was the constant flip-flopping between two temperatures. For minimalists, the Carbon Lite thermometer is basically a white plastic square that is totally app dependent. Unlike other smart thermometers that also display temperatures on the base, the Carbon Lite beams all of that to your phone—which isn’t ideal if you have spotty Bluetooth. We like the probe’s cable, which is round and resists kinking, and the spot-on accuracy and precision, but this was the most challenging smart model to pair, and setting custom temperatures on the app isn’t intuitive. The reasonably accurate Meater was the only wireless probe in the test, but the size makes it hard to use for much beyond large proteins. Completely app dependent, the 6mm probe is the largest we tested, which could be a challenge when shoving it into a thick roast. The GrillEye and InkBird are examples of precision without accuracy: Each model missed the target temperature in the immersion circulator test by a degree, and kept the error consistent over an hour. Both models have a similar app and these were some of the easiest models to pair with our smartphone. The GrillEye’s base had one of the best stands we tested with nearly infinite adjustability, though it doesn't have a magnet, and it displays the temperature—in case you’re away from your phone. The InkBird is the best value if you want four probes. Editor's note: This article has been updated to reflect additional information about how to modify grill grate clips for ambient probe thermometers so that they work in an oven.